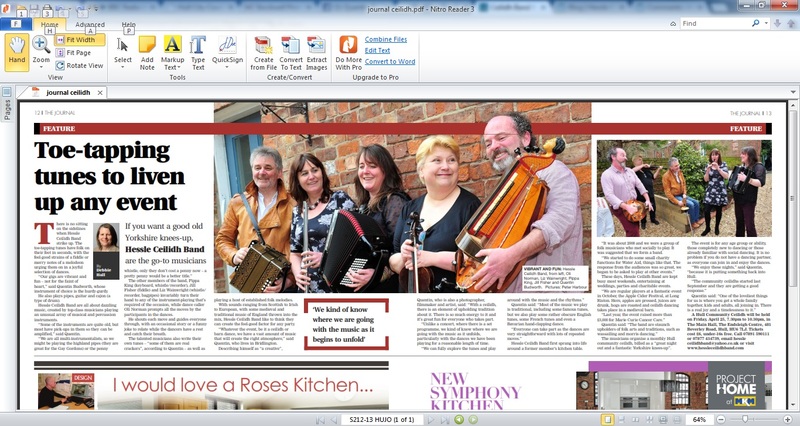 If you want a good old Yorkshire knees-up, Hessle Ceilidh Band are the go-to musicians! Toe-tapping tunes to liven up any event! There is no sitting on the sidelines when Hessle Ceilidh Band strike up. The toe-tapping tunes have folk on their feet in seconds, with the feel-good strains of a fiddle or merry notes of a melodeon urging them on in a joyful selection of dances. “Our gigs are vibrant and fun –not for the faint of heart,” said Quentin Budworth, whose instrument of choice is the hurdy-gurdy. He also plays pipes, guitar and cajon (a type of drum). When The Hessle Ceilidh Band strike up. The toe-tapping tunes have folk on their feet in seconds, with the feel-good strains of a fiddle or merry notes of a them on in a joyful selection of dances.“Our gigs are vibrant and fun –not for the faint of heart,” said Quentin Budworth, of choice is the hurdy-gurdy. He also plays pipes, guitar and cajon (a type of drum). Hessle Ceilidh Band are all about dazzling music, created by top-class musicians playing an unusual array of musical and percussion instruments. “Some of the instruments are quite old, but most have pick-ups in them so they can be amplified,” said Quentin. “We are all multi-instrumentalists, so we might be playing the highland pipes (they are great for the Gay Gordons) or the penny whistle, only they don’t cost a penny now –a pretty penny would be a better title.” The other members of the band, Pippa King (keyboard, whistle/recorder), Jill Fisher (fiddle) and Liz Wainwright (whistle/recorder, bagpipes) invariably turn their hand to any of the instrument-playing that’s required of the occasion, while dance caller Oli Norman prompts all the moves by the participants in the dances. He shouts each move and guides everyone through, with an occasional story or a funny joke to relate while the dancers have a rest and catch their breath. The talented musicians also write their own tunes – “some of them are real crackers”, according to Quentin –as well as playing a host of established folk melodies. With sounds ranging from Scottish to Irish to European, with some medieval and traditional music of England thrown into the mix, Hessle Ceilidh Band like to think they can create the feel-good factor for any party. To book the band ring Quentin on 07877434739, email hessleceilidhband@yahoo.co.uk .